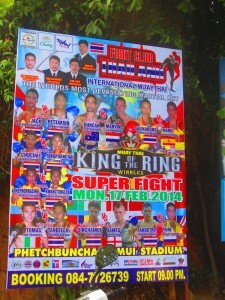 Yet another Muay Thai poster on Koh Samui. 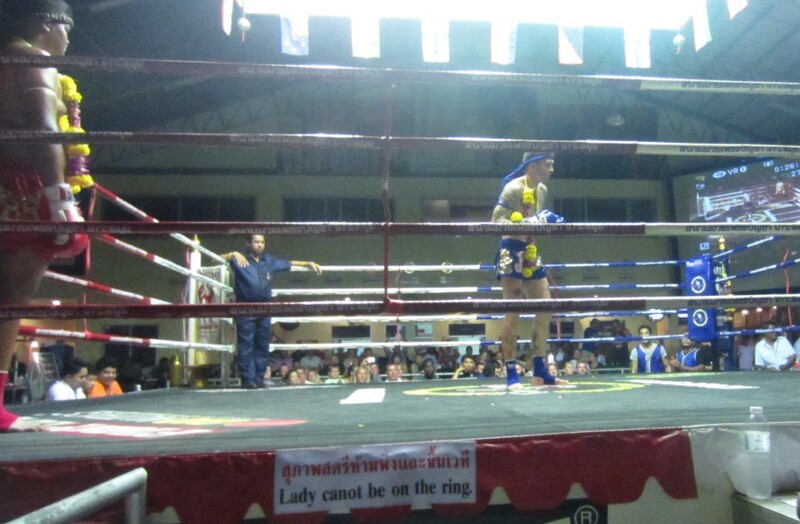 Once I regained the ability to walk after several Vikasa yoga classes, I decided to catch a Muay Thai boxing match – it is Thailand’s national sport, after all! Muay Thai is often referred to as “the art of eight limbs” since fighters use elbows, shins, knees, and feet as opposed to using only two points of contact (boxing) or four (kickboxing). This is eight points of contact too many for me so I was happy to observe from the sidelines. I went down to the Phetch Buncha stadium the day before to buy my tickets; fights are every Monday, Wednesday and Friday but in case you weren’t aware of this, there are posters plastered EVERYWHERE. Even in the most remote back road or alley, you’ll find a poster for tomorrow night’s fight. So not only do the stadiums blanket the entire island, they keep replacing them every two days. This seems a bit silly when “Yet another Muay Thai fight every MWF!” would suffice, but then a lot of poster-placing-guys would be out of work so that’s no fun. The empty stadium before the fight – ringside seats get you up close and personal. 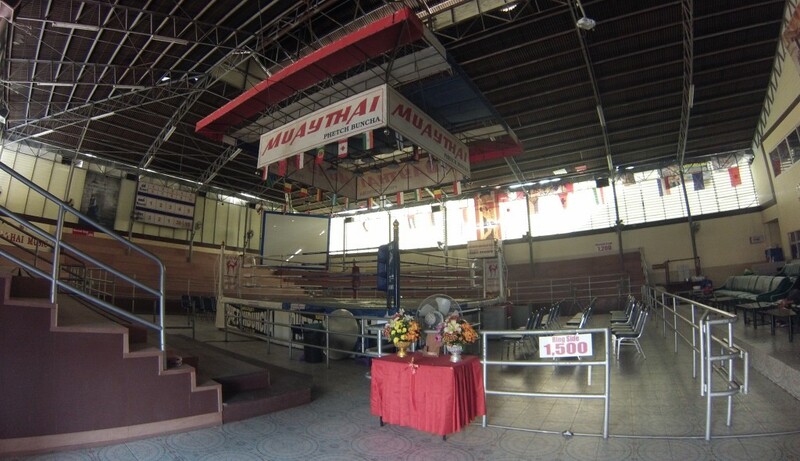 The stadium was a lot smaller than I expected, with sections for ringside, “VIP” (comfy cushioned seats with tables to hold your Chang beer), and the stands. On fight night the place filled to maximum capacity (plus more, crammed in the aisles and pressed against the rails). 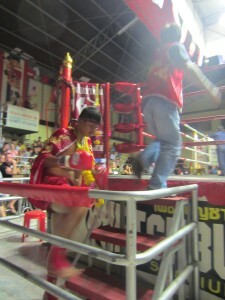 The crowd had a few foreigners but was mostly made up of sweaty screaming Thai men making bets on which fighter would be knocked unconscious first. 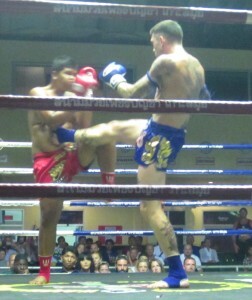 A British Muay Thai boxer performing his Ram Muay to all four sides of the ring. Before the match begins the boxers perform the Wai Khru to show respect for their trainers (and, back when matches were performed in the royal palace, to apologize to the king for the impending violence). The boxer circles the ring three times then kneels and bows in the middle to honor God and ask Buddha for protection. Once formalities are out of the way, the boxer performs the Ram Muay, a personalized ritual to show off to the audience and get pumped up (at least this was how I interpreted it). All of this goes on for quite awhile, so I started wondering if I had accidentally come to a dance performance/bodybuilding competition before the first match even began. Once the gods have been pleased and the audience teased, the fighting actually begins. Somewhat. A tiny band in the corner strikes up a very high-pitched, screeching (ie, unpleasant to the ears) tune, and the boxers close in and then begin… dancing? Muay Thai is all about finding your opponents weak spot and waiting for an opening, so boxers will feint with their knee or shin to feel out the competition. This means that for a few minutes, the two boxers look like they are dancing around each other, one knee bobbing up and down with toe pointed. But once they warm up to each other, it gets messy quickly. The Thai teddy bear entering the ring with cape, headband and armbands. In the final match of the night, they pitted a plump young Thai boxer who looked like a teddy bear in human form against a terrifying British guy covered in tattoos. If I’d been in the gambling sections, I would’ve bet $1 with a billion to one odds that the teddy bear gets creamed, and I would’ve won a billion dollars. The punches that these guys land are sickeningly solid, sending the recipient reeling backwards with eyes rolling into their heads, trying unsuccessfully to stay focused and avoid the next punch. The British boxer delivers the final match-ending blow. Teddy bear down. Muay Thai has been around for thousands of years but became really popular in the 1900’s. In the early 1930’s fighters began wrapping hemp rope around their fists but after deaths in the ring, the wearing of rope was outlawed and modern day fighters must wear gloves. Good call. The hero of Muay Thai folklore is Nai Khanomtom. In the late 1700’s Burma invaded Thailand (known then as Siam) and took thousands captive. In 1774 King Manga organized a religious festival and ordered a boxing competition. When Thai boxer Nai Khanomtom entered the ring, be performed his Wai Khru and knocked his opponent flat out. The Burmese were convinced the Wai Khru was black magic, and sent in nine other opponents to fight Nai Khanomtom. You guessed it, he whooped them all, without a break. Needless to say, King Manga declared that “Every part of the Thai is blessed with venom!” and gave him Nai Khanomton his freedom and two hot Burmese wives. A hero, indeed! 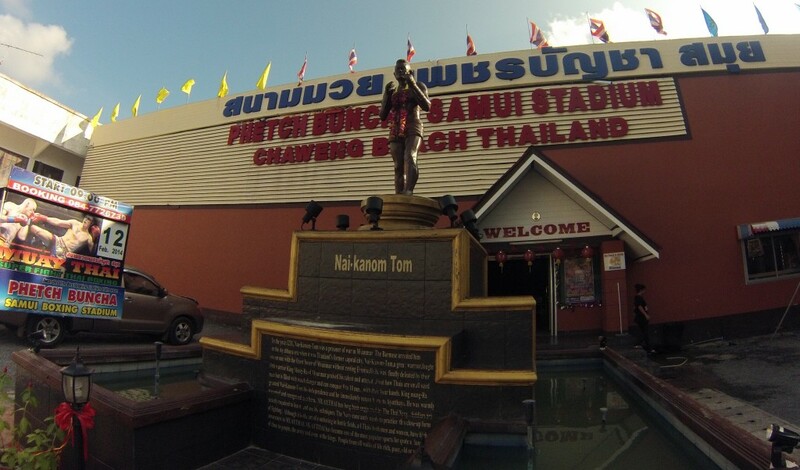 Statue to Muay Thai hero Nai Khanomtom outside Phetch Buncha stadium, Koh Samui, Thailand. I had no idea you were in Thailand! You might not remember me, but I volunteered with Akilah in the summer of 2012, and stayed with you at Elizabeth’s house briefly when I first arrived. I am currently 8 months into a year long contract teaching Environemtnal Ed at an international school just outside Chiang Mai! Feel free to send me a message if you plan on coming up north! I’d love the chance to return the hospitality you offered me in Rwanda. If you plan on staying south though, I highly recommend the sleepy little hippy island of Ko Pu, easily accessed by ferry from Krabi.